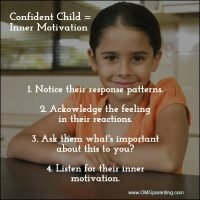 Confidence Building in Your Child - What Comes First? - OMG Parenting!OMG Parenting! Many parents wonder about confidence building. I thought about it when my daughter wailed as she tried to make it up the snowy hill. Because she was not even two years old and was wailing, I helped her. Did that build her confidence? I thought about it many times after that – when assignments were difficult, when it was time to do the oral report in front of everyone, when she had a flute or clarinet solo, when she had to find her way in a dance troupe, when she tried out for a play or had to speak up in the foreign language class. And so many times more! I’ve also counseled a lot of parents through the tricky toddler and teen years, when you don’t want your kiddos killing themselves but you also don’t want them losing their desire to strut their stuff, to lose confidence. When I think of real confidence, I’ve come to also think of inner motivation. Having confidence means we are able to choose if we want to take a risk. E.E.Cummings beautifully describes the marriage between inner motivation and confidence. Your child has some kind of inner motivation if they are letting a situation define them. So when working towards confidence, I’ve found it’s good to start with their inner motivation and then work towards the confidence. Notice your child’s pattern of responding to situations. Are there certain kinds of situations that derail them? Are they someone who just lets challenging situations ‘run off their backs’? Do they respond the same when they have the skills versus when they aren’t skilled at what they are doing? Once you notice patterns you can be ready to respond using the process below. If you look for patterns but it seems more random, again, jump in using the process below. Always acknowledge their feelings when they are reacting to a situation. There might be more than one! But this isn’t that time to say ‘man up’, or ‘stop being a wuss’. You can do that. But you are imposing an external motivator on them – to look good in your eyes. Know that the feeling they start with may not be the feeling with which they end. I learned after a while to just let it take its course! It’s the power of ‘name it, tame it’. Many times children resolve their own reaction and come to their own solution when someone does this, without comments about how they COULD see it or SHOULD see it. If they seem to be getting stuck and unable to problem solve or just move on, ask them what’s important to them about the situation? When they tell you, ask them what’s important about that? And you keep going with that question until they get their ah-ha. This is going for that inner motivation for which you are looking. It starts to take them beyond letting the situation define them into their self definition. LISTEN FOR THAT INNER MOTIVATION – this is where their growth mindset is showing up. This is where their confidence will emerge from – finding ways to go after that which interests them. And then, because you know their inner motivation, while they are dealing with their situation, you can leave them notes that speak to that motivation! Help them build skills. This can mean you find the person who helps, you watch you-tube videos with them about the skill they need, or you cheer them on even as you acknowledge how frustrating/scary it can be. Keep it next-step oriented if it gets overwhelming. Children are new to so much! They experiment through play, trying different activities, trying on different personalities and friends, or taking different courses. It’s all trial and error though until they find something they settle in. I believe you can also help children to confidently walk away from something that isn’t what they thought it would be. Quitting does not always mean lack of confidence or letting the situation define them (maybe that is a positive, after all). Which brings me to the part of confidence building that has to do with you, the parent. If you don’t want the situation to define their reactions, what do you need to do to not become part of the situation? When dealing with character building in your child, it is best to be asking yourself “what are my motives?” This is a goal in your parenting, a great one, yet it makes you susceptible to jumping in there with what you want to teach them, what you oh-so-eagerly want them to learn! This means that you can wind up pushing the process, missing the point, fixing it for them, and in the end, making them less confident. It helps to remember that sometimes children, like the rest of us, unfold quickly after situations, slowly after other situations. Every child is so different, as is every situation. If you keep tuning in to them and to yourself, you’ll know when you are on track or off. You can go back into this process and decide what you want to do differently if need be. Building confidence is lively with what I call the dance of parenting. We take a step into it, experience the response and move from there. The dance could be getting off step as a result of our worries, our doubts about whether our being a good parent or not, or because we feel lost. It’s these very loving interests in how things work out for our children that bring alive the dance of parenting. And why I wrote a book for parents about how to stay in the dance, feeling balanced! Check it out here. I hope these considerations help, as you move through different life situations with your children in a way that helps to build their confidence. Confidence waxes and wanes. Your child will absorb the positives you offer as you build your skills in this area of parenting.